This is the trickiest part of tiling but if you take your time, measure and cut carefully, you should be able to get excellent results. 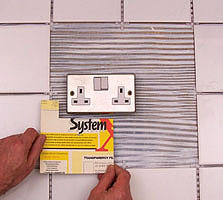 First, tile as close as you can to the socket/switch. To make a very tidy job you'll need to get the awkward tile a few mm. behind the socket/switch. For each tile which will lie behind make a template out of a bit of scrap card the size of the tile and cut out a section so that approx. 5 mm lies behind the socket/switch. In the picture shown above right 4 tiles are affected and each need a slightly different sized corner removed. If only 2 tiles are affected you will have to make U_shapes out of each one similarly. 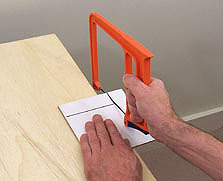 -Use a hand tile saw. Using a hand tile saw to cut out shapes. Again make a template the size of a tile. 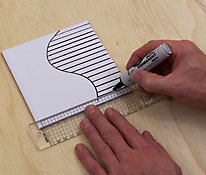 Use paper rather than card so that you can easily form the paper around the object to copy the exact shape you need. Transfer the paper template to the tile to mark it then cut out the shape from the tile. To help you get the curve right you may also find useful a profile gauge. This is a clever tool which is made up from lots of thin plastic strips which move to form the exact profile of the shape you want to copy. 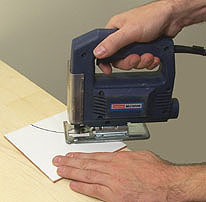 -Use an electric tile saw. You can get a curve with an electric tile saw with series of straight cuts. 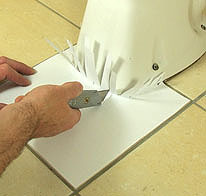 Mark out the tile then after making a series of straight cuts with the saw use tile pincers to nibble off each strip. You should be able to nibble a quite tidy edge. If necessary get an smooth line by by finishing with a tile file. To tile round a small pipe will depend on how the tiles are positioned in relation to it. You may only need to take a small section from the side. Or you may have to cut a tile in half and take a semi circle from each part using one of the above methods. Alternatively you could cut out a slit in a whole tile the width of the pipe so the tile slides in.